NSW Department of Primary Industries (NSW DPI) and the NSW Office of Local Government have a shared interest in safeguarding animal welfare and promoting responsible pet ownership in NSW. In 2015, the NSW Government established a Joint Select Committee to look into companion animal breeding practices. This followed media reports of poor companion animal breeding practices in commercial for-profit breeding facilities in NSW and related prosecutions for animal welfare offences. The Inquiry included an open submissions process and public hearings and generated a very large level of interest in the community and the media. The Inquiry received 344 submissions, a petition containing 3,000 signatures, and over 2,200 emails and other correspondence. The Joint Select Committee took evidence from 42 witnesses at three public hearings. In response to the final report of the Inquiry, the NSW Government committed to supporting, or supporting in principle 27 of the Inquiry’s 34 recommendations. Since that time, a number of these recommendations have already been implemented and this work continues. 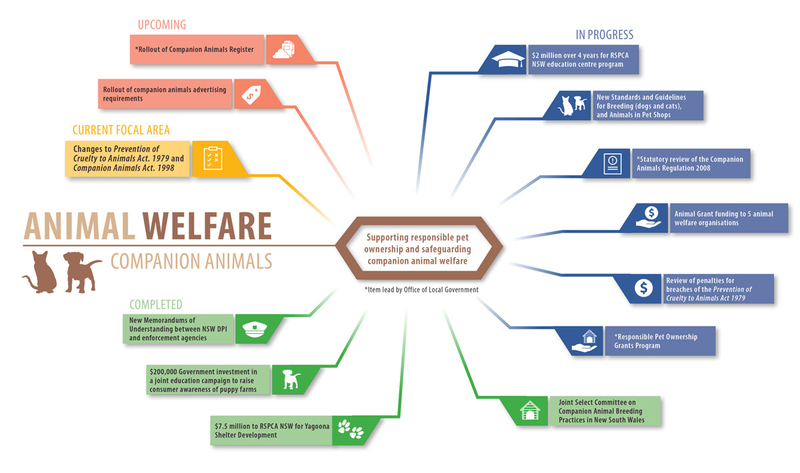 In 2018 the NSW Government provided about $1 million to RSPCA NSW as part of a four year agreement to carry out education and capital works, and also enforce the Prevention of Cruelty to Animals Act 1979 (POCTA Act). The NSW Government invested $200,000 in a joint education campaign to raise awareness of the reality of puppy factories, with a website, advertisements and social media campaign. We want to ensure penalties included in the POCTA Act present a strong deterrent, so we are reviewing them against other states and other penalties in NSW. We are in the process of reviewing the Standards and Guidelines for breeding dogs and cats and for animals in pet shops. In 2018, we introduced changes to the Companion Animals Act 1998 and the POCTA Act to improve identification and promote responsible pet ownership. In late 2018, the Office of Local Government launched an improved NSW Pet Registry to enhance digital pet registration. NSW DPI will be working with stakeholders to establish a new set of Standards and Guidelines for pet shops and breeders.